How should I connect my LED strips? To connect LED strip, it is often necessary to solder wires onto the LED strip. You need to solder the wires to the soldering points. These are the copper colored points that are found, for example, every 2.5, 5 or 10cm on the LED strip. Single color LED strips have two soldering points: + and -. However, there are many different types of LED strip with more soldering points. An RGB LED strip has 4 soldering points, R, G, B and +. And an RGBW LED strip has 5 soldering points. 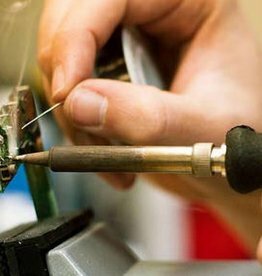 The best way to properly solder wires to a LED strip is to first apply tin to the soldering points and the wires, and afterwards melting the soldering points and wires together. If you have no idea how to solder, don't worry! We can do this for you. You can add this service to your order by adding soldering service to your shopping cart. Do you have a complicated project which requires a lot of soldering? Please let us know, then we will make a quote for you.